A new CD with a selection of Chabad Niggunim, produced by Yisroel Cyprys and with vocals by Yosef Silberstein was released this week. A new CD entitled “Oisiyois Hanegina” was released this week in time for Sukkos. The CD contains a selection of Chabad Niggunim, such as Nigun Fonke, Nigun Simcha, Nigun Reb Meir Shlomo Yanovsky, and others. 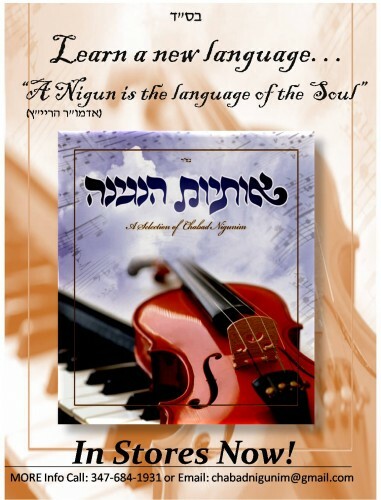 The CD was produced by Yisroel Cyprys, with vocals by Yosef Silberstein. Also included is a 12 page booklet with the background of each nigun. “Oisiyois Hanegina” is available in Crown Heights Judaica stores. For more info call 347-684-1931, email chabadnigunim@gmail.com or go to www.ChabadNigunim.com.